This post has been brought to you by Ecocentric Mom and contains affiliate links. By clicking on links and purchasing a subscription box from Ecocentric Mom I will receive a small compensation. All thoughts and opinions are my own based off my experience with the products. My June Mom Box arrived last week and I am happy to finally be able to share it with you! I opened it and it was happiness in a box; specially designed with just mom in mind. The last thing I ever think about is myself. So receiving my monthly Mom Box is a nice little reward for all the hard work that goes into being a mom. 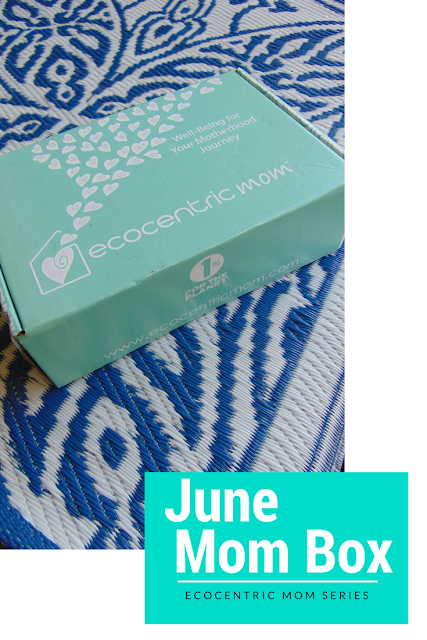 Ecocentric Mom has all sorts of boxes whether you're a mommy-to-be, a new mom, or a mom with kids of any age. The box you choose will be packed with all sorts of goodies for every stage of motherhood. The monthly box will contain 5-9 full-sized and sample sized items of products from consciousness brands for home, health, beauty, and baby. The subscription boxes start at $22 a month and contain a minimum retail value of $40 or more per box. Pick from the Pregnancy Box, Mom & Baby Box, or the Mom Box and enjoy the awesome products inside. Here's a look into what came in my June Mom Box! Lyeska Moisturizing Facial Lotion - I love this face lotion. Not only does it smell good but it leaves my face feeling extra soft and doesn't leave a greasy feeling behind either. Meliora Cleaning Product (Stain Removal Soap Stick) - This stain removal stick is awesome! I used it over the weekend on my one of my son's white shirts. All I did was wet the fabric and rub the stick along the stain and walla! The stain was gone. It's really going to come in handy this summer removing grass, dirt, Popsicle juice, and of course chocolate from s'mores on the 4th of July. Glow - I have yet to use this, but I did swatch it. It feels a little oily which makes me a little nervous since I have oily skin. It does have a nice subtle glow to it though. Compact Mirror - I never have a mirror on hand when I need to touch up my lipstick or eyeliner throughout the day. Now I can just tuck this into my makeup bag and use it when I need it. Made Good Granola - This granola was delicious! It was my first time trying it and I plan on buying a couple of bags to have to home. My two year old daughter ate most of the bag and I didn't feel guilty letting her munch away on a healthy and organic snack. One of the monthly subscription boxes would make a great gift for a friends or family or just because for you. You can subscribe here. Get $10 off your first Mom Box using code SHARE10OFF2017. Offer expires July 31, 2017! Thanks for stopping by and feel free to leave a comment. Have a wonderful day! These subscription boxes would make such a fun unique shower gift or gift for new moms. I love the idea of getting to sample different products every month. Fun idea! Its a great gift idea or a nice treat for yourself every month.